Free ride, take it easy. Ever been near Marymoor when the sun comes out and you’re suddenly overtaken with an overwhelming desire to jump on the Sammamish River Trail and ride off, cool breeze in your hair…but alas, you’re without your bicycle. What to do, what to do? Thanks to the Dasani Corporation, Marymoor Park offers Trek Classic Cruisers as “community blue bikes”, which we loan out FOR FREE!! 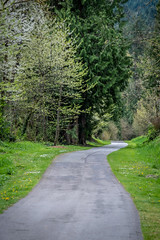 All you need is a bike helmet and a swipe card (register at the Marymoor Park office), and off you go, across the Marymoor Connector Trail to the Sammamish River Trail or East Lake Sammamish Trail. There really is no way not to smile once you get behind the handlebars of one of these babies. Pop over to our site to learn more. i can see the white knuckles on that person.